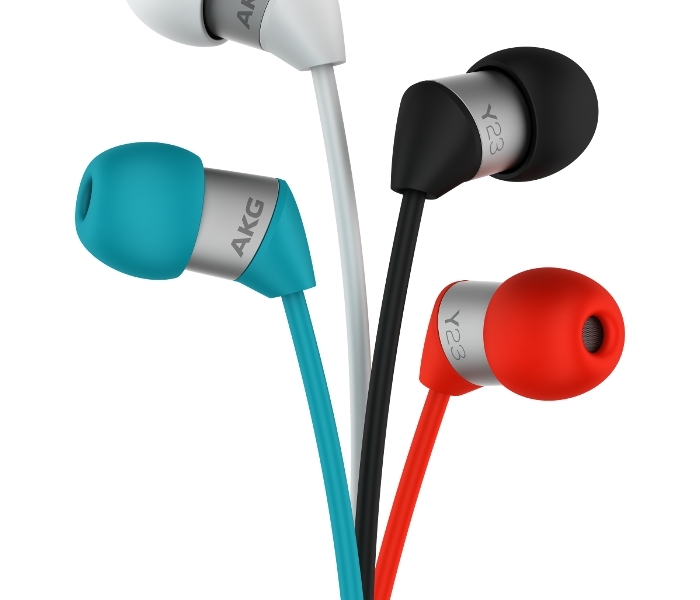 CES 2015, LAS VEGAS – HARMAN, the premium global audio, infotainment and enterprise automation group (NYSE:HAR), introduces its AKG Y20 and Y23 in-ear stereo headphones, combining powerful, undistorted sound with small comfortable design. AKG signature sound is the result of more than 60 years of audio expertise and with the launch of the Y20 and Y23 ultra-small headphones, that sound is now easier and more affordable than ever before. The AKG Y20’s powerful 8 mm drivers deliver high quality sound, while the ergonomically designed tilted ear-tips featuring FlexSoft®, multi-size silicone sleeves are crafted to stay attached to the ear in almost any situation – making them ideal for people on the move. Their polycarbonate composition is both lightweight and durable, adding to their striking outward appearance. The integrated universal, one-button remote cable allows you to control your music with greater ease, as well as answer calls between listening to your favorite tracks. 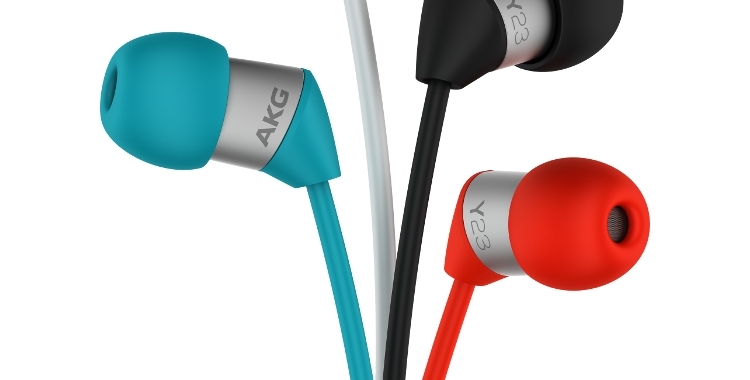 The AKG Y23 is one of the smallest in-ear headphones available within an affordable price range. The 5.8 mm high performance driver provides a powerful AKG studio sound within an incredibly small space. Their innovative ear tip technology combines two materials to better fit your ear, while their low weight ensures you’ll only feel the vibe, not the headphones. The Y23 headphones are available in four colors and with the choice of straight cable or a universal remote that allows you to answer and end calls, or play and pause music, without taking your headphones off. With powerful 8 mm drivers, the Y20 delivers the high-output sound and accuracy you’ve come to expect from AKG. The Y20 isn’t merely designed to fit an ear perfectly. It connects seamlessly with almost any portable or home music source. The Y20 stereo in-ear’s polycarbonate design is built to be both portable and durable. Not only are the Y20 in-ears built from lightweight materials, they also come with a compact carrying pouch that ensures easy, on-the-go storage. The AKG Y20 comes with silicone sleeves in three sizes (small, medium and large) to ensure a comfortable fit for anyone who likes listening to music for hours on end. The AKG Y20’s specially angled ear-tips are crafted such that they fit snugly into ears of any size or shape. Their scratch-resistant professional grade rubber and matte finish design take the Y20s to a new level of professional design. Superior sound quality and connectivity that you never expected in such an ultra-small model. A wide range of connectivity with a one-button, universal remote connects you to most smart phones instantly. The Y23 is also available as straight cable version. Specially-selected 5.8mm drivers deliver precision sound with the sound quality properties AKG has made famous. With 65 years of engineering and sound know-how, AKG is among the world’s leading manufacturers of high-quality headphones, microphones and wireless systems for professional users, musicians, engineers and music lovers. Today AKG is synonymous with premium sound quality, stands for passion in music providing the highest quality and ongoing innovation in the world of music. HARMAN (www.harman.com) designs, manufactures and markets premier audio, visual, infotainment and enterprise automation solutions for the automotive, consumer and professional markets. With leading brands including AKG®, Harman Kardon®, Infinity®, JBL®, Lexicon®, Mark Levinson ® and Revel®, the Company is admired by audiophiles, musicians and the entertainment venues where they perform. More than 25 million automobiles on the road today are equipped with HARMAN audio and infotainment systems. HARMAN has a workforce of approximately 16,600 people across the Americas, Europe, and Asia and reported sales of $5.6 billion for the 12 months ended September 30, 2014. The Company’s shares are traded on the New York Stock Exchange under the symbol NYSE:HAR.